DCK Investor Edge -- There is a new global hyperscale data center player, and it happens to be embedded in an old retail colocation giant. 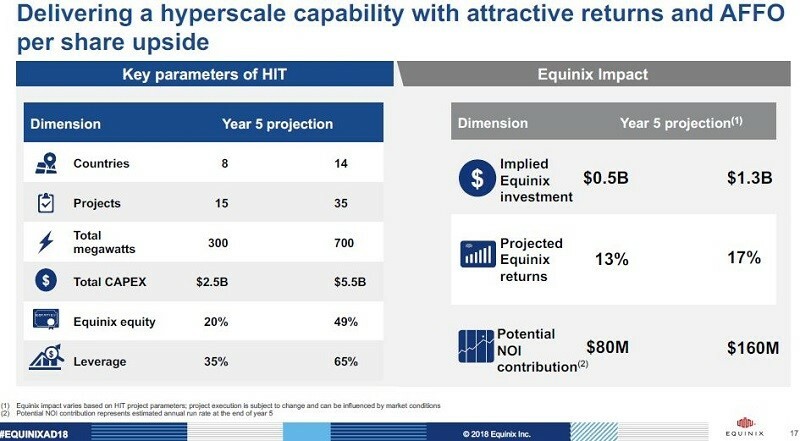 Equinix recently revealed the scale of its new strategic wholesale data center initiative, HIT, or Hyperscale Infrastructure Team. HIT, it turns out, is much larger than investors could have known based on what the company has said in the past. 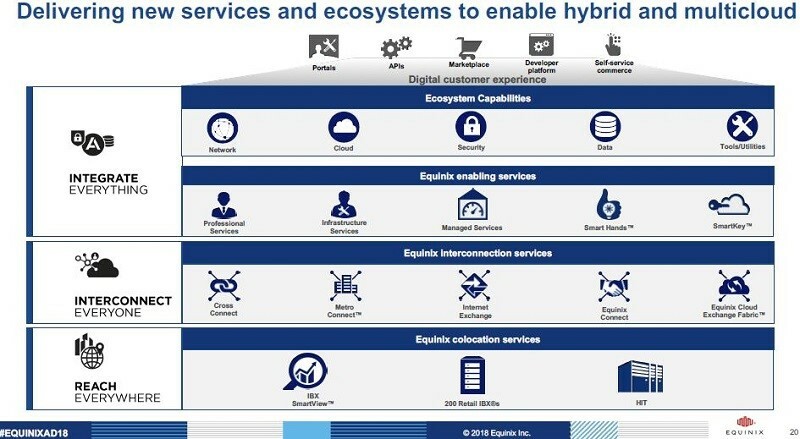 Meyers’ team, consisting about 100 employees, is tasked with "future proofing" Equinix, which includes catching the "next wave" of hyperscale deployments. 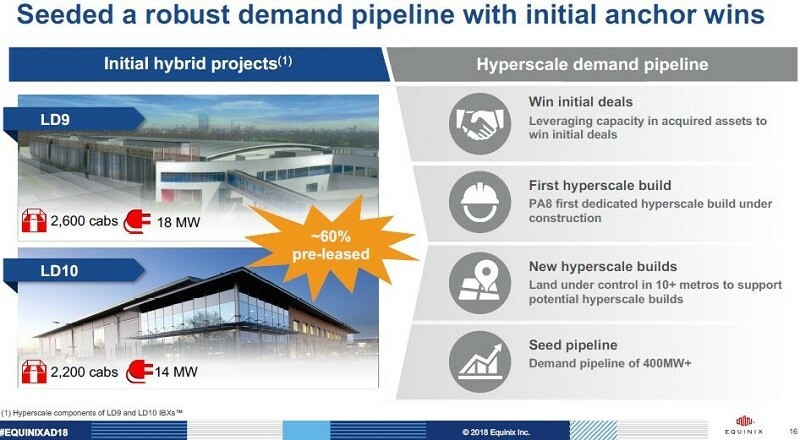 Last quarter, Equinix revealed that its Paris 8 data center would be the first built as part of the strategic HIT initiative. The company hired Jim Smith, former CTO of the wholesale data center leader Digital Realty Trust, to oversee HIT. These build-to-suits are intended to service the needs of the top 12 global cloud, technology, and SaaS providers. Notably, during Q1 2018, Equinix did not book or report any additional hyperscale activity. 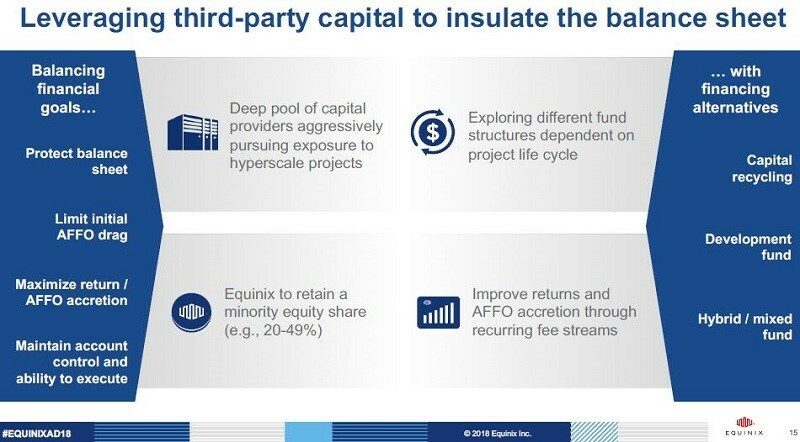 During the recent Equinix Analyst Day there were presentations from multiple Equinix executives highlighting performance in the Americas, EMEA, and Asia Pacific, and others drilling down in detail on the technical side of the Equinix global platform. The icon in the bottom-right corner represents HIT -- now a foundational component of the Equinix global portfolio. In-house and partner interconnection and managed services are layered over the top of the physical data center network. 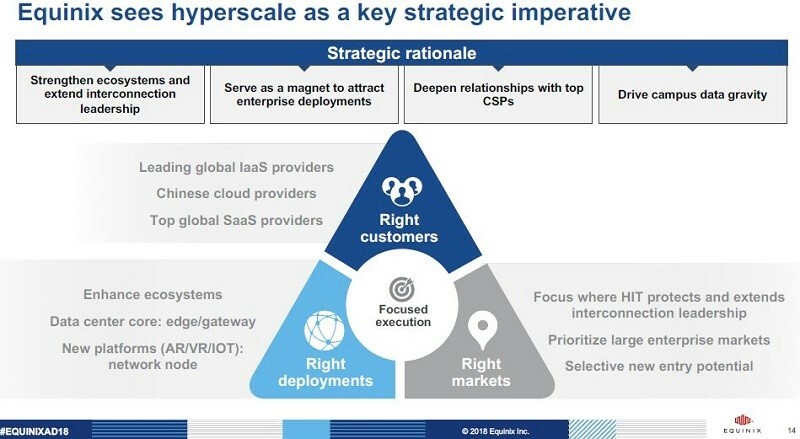 In its strategy, planet-scale cloud service and SaaS providers serve as magnets to attract enterprise customers. This echoes the strategy Digital Realty, Equinix’s biggest rival, launched after it acquired the North American colocation giant Telx in 2015. Equinix will continue to focus upon major global metropolitan markets. During the next five years 5G will become another driver for data growth, Meyers said. He believes 5G will accelerate use cases by capturing data at the "edge" and bringing it back to IBX data centers to be mined by AI for big data insights. In addition to the dedicated PA8 hyperscale build, London 9 and 10, which house a mix of hyperscale and retail cabinet deployments, will be contributed to HIT. At the midpoint of guidance, Equinix projects 100MW per year of build-to-suit and hybrid IBX hyperscale deployments. On average, the 25MW per quarter of wholesale deployments would rival the scale of many other data center peers. The off-balance sheet joint venture approach allows for more leverage to generate 13-18 percent returns and avoids a potential AFFO per share growth headwind. Instead, it will become accretive, including fee income. Meyers shared that Equinix would likely have multiple institutional capital partners, leveraging different partners in different regions. In Asia Pacific, for example, the "right" JV partner could also help open local markets for Equinix's core colocation business, he explained. The eventual hyperscale contributions to EBITDA, AFFO per share, NOI were not included in May 2018 full-year guidance, reaffirmed on Analyst Day by CFO Keith Taylor. Notably, HIT could account for 5-10 percent of revenues, and contribute 5 percent to AFFO per share, Taylor said. The new initiative gives Equinix shareholders a new revenue stream, while also expected to help grow the retail colocation business. In a sense, it is a free option on what could potentially become a significant wholesale data center business.